Simon Girty was an important frontiersman in the Ohio Country in the years before, during, and after the American Revolution. Girty was born in 1741 in Chambers Mill, Pennsylvania. American Indians eventually killed Girty's father. By the time Girty was fourteen his family had moved to Sherman's Creek in eastern Pennsylvania. During the French and Indian War, the Girtys, fearful of attack, sought refuge in Fort Granville. In 1755, a combined army of French soldiers and their American Indian allies captured the fort, taking several British colonists captive including Girty. He was first taken to Kittanning, a Delaware town, but he eventually found himself in the hands of the Seneca, who took him to the Ohio Country. There, he was adopted into the Seneca nation. Girty seemed to enjoy his new surroundings, spending his late teens learning the language and customs of the Senecas. In 1758, a British army commanded by General John Forbes captured a major French outpost in the Ohio Country, Fort Duquesne. Their French allies having yielded to the British, the Seneca signed a peace agreement with the English in 1759 and agreed to return all captives. The natives returned Girty to his mother, and he spent the next several years as a struggling farmer. He also served as an interpreter for traders seeking furs from the Delaware in western Pennsylvania. As more British colonists moved into the area, sparking tensions with local American Indians, British officials enlisted Girty's help in negotiating treaties. Throughout the late 1760s and early 1770s, he served as an interpreter at Fort Dunmore (formerly Fort Duquesne and subsequently Fort Pitt). He also assisted Lord Dunmore in Lord Dunmore's War as a scout and interpreter. With the outbreak of the American Revolution, both the British and Americans sought Girty's assistance. Each side hoped Girty's knowledge of American Indian language and customs in the Ohio region would help them secure alliances among the various tribes in western Pennsylvania and Ohio. The frontiersman first sided with the Americans, assisting General James Wood in 1775 in negotiations with the Shawnee, the Seneca, the Delaware, and the Wyandot. Girty did not like the structure of military life and frequently clashed with his superiors. He was eventually discharged from the U.S. military and, in September 1777, was even arrested and charged with treason for supposedly helping plan the seizure of Fort Pitt. The conspirators reportedly hoped to massacre the fort's residents and then turn it over to the British. U.S. authorities eventually acquitted Girty, but his desire to help the U.S. had evaporated. 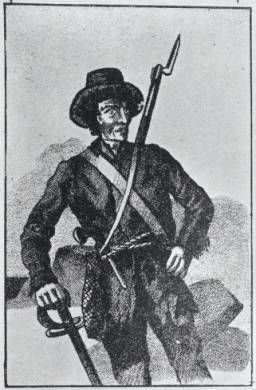 On March 28, 1778, the frontiersman left Fort Pitt and offered his services to the British military in Detroit. From 1778 until the American Revolution's conclusion in 1783, Girty served as an interpreter for the British among American Indians in the Ohio Country. He also led American Indians in several attacks on U.S. soldiers, including laying siege to the American garrison at Fort Laurens in eastern Ohio in 1779. He also assisted in the removal of Moravian missionaries, such as David Zeisberger and John Heckewelder, along with their American Indian converts, from along the Tuscarawas River to Upper Sandusky, where the British could more easily watch them. U.S. authorities labeled Girty a traitor and even offered a reward of eight hundred dollars for his capture or death. During the war, Girty earned a reputation for his brutality. He supposedly had no misgivings about killing others or about watching them be tortured to death. He became well known for not ending the suffering of Colonel William Crawford in 1782. The Delawares captured Crawford and tortured him before executing him in retaliation for the Gnadenhutten Massacre a few months earlier. During this incident, Pennsylvania militia murdered ninety-six Delaware men, women, and children. Before killing Crawford, his executioners marked him for death by painting his face black. The Delawares eventually burned Crawford at the stake. During his torture, Crawford reportedly begged Girty, who was in attendance, to shoot him. Girty refused. If he had fulfilled Crawford's wish, the American Indians would most likely have killed Girty for not allowing them to attain justice in their own way. Americans later vilified him for allowing the episode to proceed. Girty was a man walking between two different worlds. It was a fine line to walk, because if he offended either side, the result could have been his death. Upon the American Revolution's conclusion, Girty continued to assist American Indians in resisting American settlement of the Ohio Country. He played an active role in the defeat of General Arthur St. Clair and his army in 1791. He also participated in the Battle of Fallen Timbers in 1794. Following the natives' defeat at Fallen Timbers at the hands of General Anthony Wayne, many American Indians residing in Ohio realized that they would have to make peace with the U.S. and thus refused Girty's continued demands for resistance against white settlement. He spent the next several years near Detroit, but after the British abandoned that community, Girty sought safety in Canada. He died there in 1818. Butterfield, Consul Willshire. History of the Girtys: Being a Concise Account of the Girty Brothers--Thomas, Simon, James and George. Columbus, O.H: Long's College Book Co., 1950.